When vehicles are occupying on-street parking spaces overnight, snow clearing equipment is unable to effectively clear the snow. To enhance snow clearing and improve accessibility downtown, a new pilot parking restriction will be in place 3:30 a.m. to 6:30 a.m. daily, beginning Tuesday, Jan. 30, 2018. Vehicles parked in violation of the restriction will be impounded at the owner’s expense. 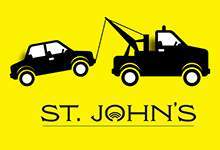 The towing charge and the administration fee is $250, with a daily impounding fee of $25. The area of restriction will be marked with signs on Water Street between Prescott Street and Waldegrave Street, and on Duckworth Street between Cochrane Street and New Gower Street. Alternate parking options include: City Hall Parking Garage at 8 New Gower Street, 286 spaces open to the public (Level 1, 3, 4 and 5) on weekdays from 6 p.m. to 8 a.m. and on weekends; and, at privately owned parking garages at 351 Water Street and 330 Duckworth Street. Over 400 on-street parking spaces are not affected by the restriction. Further information on parking restrictions in the downtown is available on the website.